Join us on for an upcoming Admissions Virtual Info Session (VIS) hosted by the Enrollment Department. During this info session, you’ll speak with Enrollment Advisors who can provide more details about the application process, provide helpful tips for developing a competitive application and more. This session is suitable for those who have attended the Academic virtual info session and are currently applying for the first-professional Doctor of Physical Therapy (Full-time or Flex). 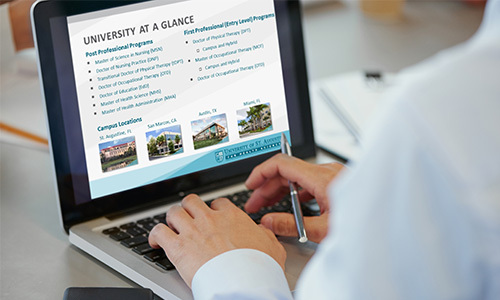 Complete the form below to register for this or future virtual information sessions and get a jump start on your application for admissions to the USAHS Doctor of Physical Therapy (DPT) program!